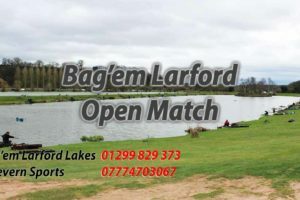 Open on Match lake, conditions were warm & Breezy. 1st on the day was Jordan Holloway (Larford) on peg 62 from the Match Burr with a weight of 102-02-00 fishing down his edge on corn. 2nd was Jamie Wilde (Colmic) with a weight of 90-02-00 from peg 8 on Match Grass with maggots down his edge. 3rd Stu Homewood (Larford) from peg 12 weighing 86-15-00 with pellet on short pole. 6th Andy Cunstie from peg 46 weighing 64-09-00 catching on pole down his edge with corn.